This bike came from a young man who had been working on it for quite a while and just ran out of money. 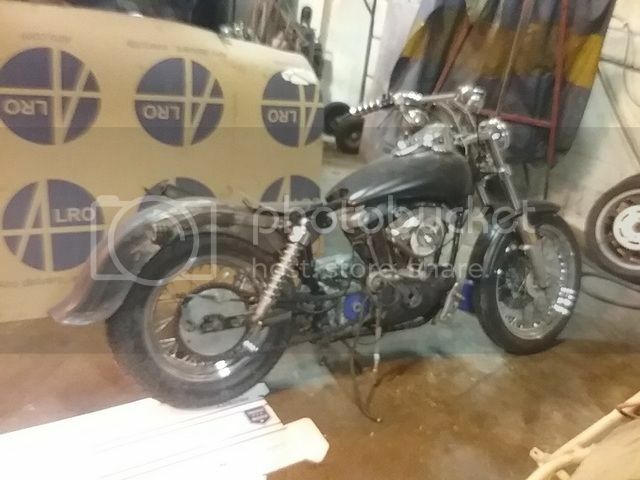 It has a newly rebuilt engine, Andrews cams, new carb, gas tank, instruments, controls, bars, tires & wheels. He fabbed up a bunch of stuff himself but we’ll probably do away with most of it. I haven’t done anything with it yet other than rescue it so right now its a clean slate for your custom build. 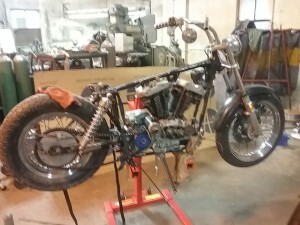 It looks to have all the parts needed to finish it, some stock, some custom, and I do have a nice rigid frame sitting next to it that I might just swap over and go full custom. This is the second 75 XL we’ve got and the first one is going to stay stock so we might as well play with this one. Its got Andrews cams in it so I’ll pull it apart a bit to see what other good stuff is there! 3/4/16: Got the sporty up on the lift and went after it a bit today……….. what a mess, about as I expected, but still a mess. It needs a total tear down just to see what’s what.